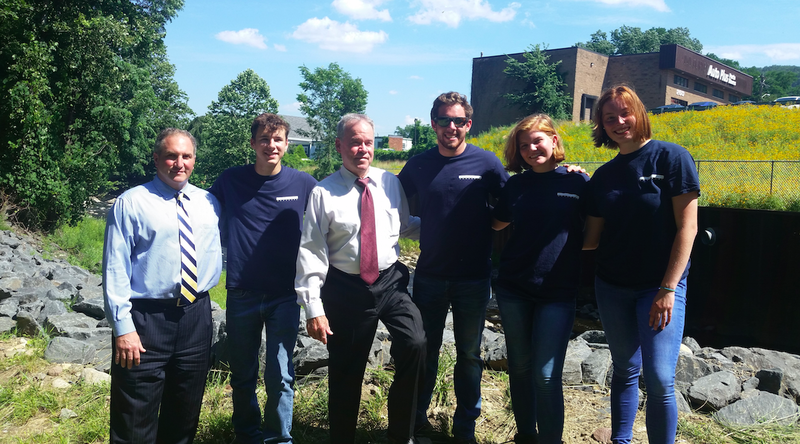 PRESS RELEASE– Rockland County Executive Ed Day announced that the federal government has awarded the county $1.02 million to pay for repairs to the bank of the Minisceongo Creek in West Haverstraw. He was at the site of the stream work Wednesday, where was joined by Vincent Altieri, executive director of the Rockland County Drainage Agency, Charles “Skip” Vezzetti, Rockland County Highway Superintendent; Haverstraw Mayor Michael Kohut, West Haverstraw Mayor Robert R. D’Amelio, members of the Rockland County Conservation and Service Corps and others. The federal funding will pay for most of the project, which included a new retaining wall to stabilize the creek bank. West Haverstraw and Haverstraw suffered extensive damage during Hurricane Irene in 2011 when the Minisceongo Creek overran its banks and flooded the area. The Rockland County Drainage Agency has been working on several projects to mitigate future flooding. A second project now underway that will be completed in the fall includes reconstruction of broken gabion baskets, stabilization of gabion baskets that are leaning into the creek, and soil nailing of these and other areas, according to Vincent Altieri, executive director of the Drainage Agency. These improvements will be made in conjunction with related work completed by the county’s partners, including the village of West Haverstraw. The village relocated a municipal storm drain downstream of the destabilized area. Members of the Rockland Conservation and Service Corps have been working this season to make sure that county-regulated streams continue to flow and remain free of debris. The Conservation Corps members have inspected 11 out of 14 county-regulated streams and completed over 45 miles of stream inspections so far this season, the County Executive said. In addition, they removed 25 obstructions from county-regulated streams all over Rockland. They also removed over 23 cubic yards of silt, rock and debris from Cedar Pond Brook in Stony Point that was deposited during Hurricane Sandy nearly four years ago. “Their work is an important part of our ongoing efforts to maintain our streams and infrastructure while we preserve our natural resources,” the County Executive said.